The Newest Lighting System | Products/Technology-Technology of KOITO | KOITO MANUFACTURING CO.,LTD. KOITO's lamp systems offer lighting suitable for every driving condition, making nighttime driving safe and relaxing. Energy-efficient and long-lasting LEDs are utilized as the light sources in the latest headlamps, rear combination lamps and other automotive lamps. KOITO's unique optics control system and optimized lighting system realized LED headlamps with world-leading brightness and power-saving performance. LED headlamps are widely adopted to hybrid and electric vehicles and also to mini vehicles and motorcycles. Adaptive Driving Beam (ADB) is a headlamp system that ensures wide visibility for drivers by enabling to drive with high-beams all the time while avoiding glaring to oncoming vehicles or vehicles ahead. ADB's installed camera recognizes vehicles driving ahead, working together with various sensors, and achieves fully automatic light distribution control. 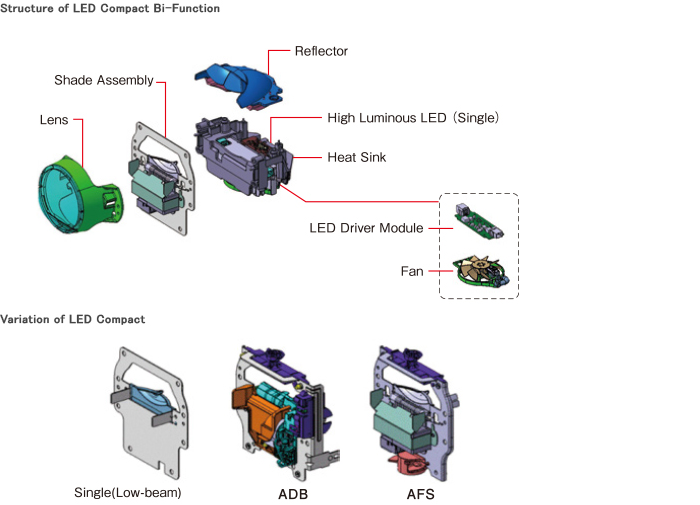 which provides a selection among lighting function among bi-functional headlamp (a LED unit switching high-beam and low-beam with a single LED), AFS (Adaptive Front Lighting System) headlamp, and ADB (Adaptive Driving Beam) headlamp. from luxury vehicles to mini vehicles. 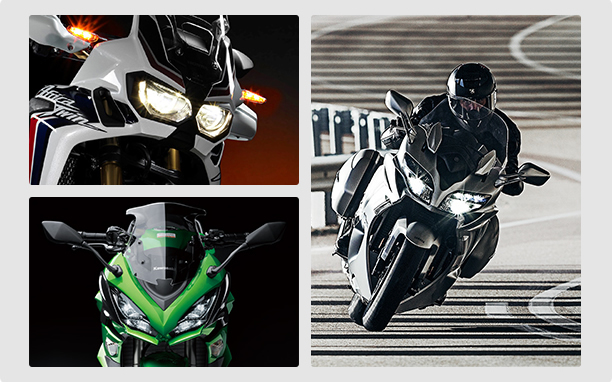 LED headlamp is also widely adopted for motorcycles, which is obliged to light up even in the daytime. As KOITO's LED headlamp offers higher power efficiency, longer life, and better space-saving, it supports safer and more comfortable ride with its optimum lighting technology. It is a replacement part for a replaceable-bulb halogen headlamp unit, which is dedicated for buses improving 3 times the brightness, 50 times the longevity, and a quarter power-consumption as compared with a conventional one. Using LEDs as the light source, LED rear combination lamp offers higher power efficiency, longer life, and better space-saving than the conventional incandescent-type lamps. Those features help to enhance safety, and increase fuel efficiency of the vehicle. Moreover, it realizes innovative designs by using surface light-emission or half-mirrored structures. KOITO adopted LEDs not only for tail and stop lamps but also for turn signal lamps and backup lamps. As for turn signal lamps, KOITO has installed sequential lighting function to make your vehicle more visible. Daytime running lamps increase visibility of the vehicle and ensure safety in daytime and at twilight. By utilizing high-power white LEDs, LED fog lamps realized higher power-efficiency, innovative design, and smaller size. Accessory lamp achieved a different appearance when it is lit and unlit. It can make your vehicle more visible by producing three-dimensional lighting.